This first sample uses a few fun little elements. 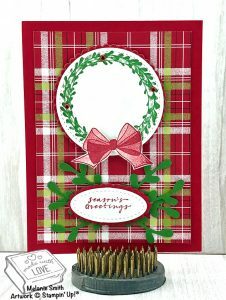 The Festive Farmhouse Designer Series Paper has been layered below the wreath. It is cut out and framed using the Layering Circle Framelits. These sets are wonderful (They come in Oval, Circle, and Square) and they are a wonderful value. The die sets have both regular and scalloped shapes that fit perfectly together for just beautiful layering. The bow was stamped and fussy cut and added with a Mini Stampin’s Dimensionals. The sentiment was cut and framed using the Layering Oval Framelits. Behind the sentiment the Sprig Punch has been used multiple times to add dimension.